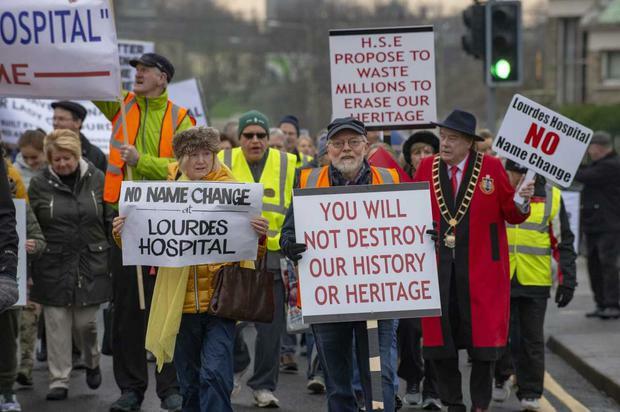 Close to one thousand people marched through Drogheda this afternoon to protest at proposals to change the name of Our Lady of Lourdes Hospital. The hospital, which is one of the busiest acute hospitals in the country, was bought by the HSE from the Medical Missionaries of Mary in 1997. It is understood that staff were asked which of three other names it should be called: Drogheda University Hospital, Drogheda Regional Hospital or Drogheda General Hospital. Today's march culminated with a letter to the general manager of the hospital being handed into a representative of hospital management. The letter, from the 'Save the Name' committee says that its petition to retain the name has so far been signed by 8,020 people. It wants to meet with hospital management and says there should be consultation with local people before any name change takes place. A number of people marching today said the HSE should instead spend money on additional nurses or other resources for the hospital. Meanwhile Labour Senator Ged Nash, who is from Drogheda, said that the RCSI group which manages the hospital has confirmed that no funds have been allocated to the proposed name-change of the hospital in 2019. He also said that replies to Parliamentary Questions also confirm that no money has been spent so far on the proposal and no final decision has been made.